elimar908@btinternet.com - preferably on a Word document and be non political. 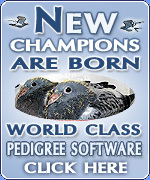 Elimar Pigeon Services reserves the right to decline publication of any material not deemed to be in the best interests of the sport. Any views expressed are those solely of the writers and Elimar Pigeon Services accepts no responsibility for their accuracy. News Report 68 Alan Busteed - Mayfield R.P.C. News Report 70 Jonathan Bailie - No Guts, No Glory.